Aquarius is always considered as one of the star signs that have unique characteristics. Aquarians are measured as friendly, honest, and loyal to everyone in whom they put the faith. However, they like to do whatever they want and free from a chain of laws. The ingenuity is a special trait that helps them to deal with all situations. However, their unemotional and stubborn temperament can make acquaintances tired. Learn more about Aquarius Personality Traits NOW! With a unique personality, what will happen when combining other star sign with Aquarius? Is there any good partner for Aquarians or who will become their enemies? All will include in the Aquarius Compatibility Chart, let’s take a look to know more about this star sign. Which are BEST Aquarius compatibility signs? 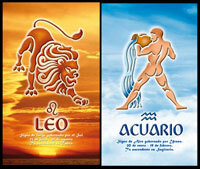 In astrology, Libra, Gemini and, Aquarius itself are considered as the most compatible sun signs when standing with Aquarius. Aquarius – Libra: two star signs will form a beneficial relationship. These two sometimes may find themselves bringing their minds in the extended discussion. They both share the energies that can’t find in other star signs, but in a good way. The Aquarius compatibility with Libra can make a good friend or partner. Aquarius – Gemini: this couple may create a perfect match. They will be a wonderfulfriendship and relationship. The same point of these two is that they want to experience the new things in life. Sometimes there’ll be a few issues, but both signs tend to give all to their partner. Aquarius – Aquarius: both of them are more independent, social, and cerebral than other signs. These two get well along together. They can share good conservation but sometimes their ideas seem to bounce off with each other as both are stubborn. However, the combination of two Aquarius is still a great match to consider. Aquarius – The Fire Signs: Aries, Leo, and Sagittarius are divided into Fire group. When you mix Air with Fire, the high passion and combustion are two words to describe this relationship. The danger is that Aquarius may feel not interested in a relationship in the future. Aquarius – The Water Signs: Cancer, Pisces, and Scorpio are just too emotional for Aquarius. Consider Aquarius In Compatibility With Pisces, if concerning. Aquarius – The Earth Signs: Taurus, Virgo, and Capricorn tend to hold and keep everything in a relationship, but with a freedom-mind Aquarius, it’s a little bit too much. So the compatibility between those Sun signs don’t bring good results as expected. How about Aquarius Compatibility With Taurus? For more information in the articles “Aquarius Compatibility Chart”, don’t hesitate to contact with us by leaving all your comments in the available box.